Our Well Travelled Brides, Kate and Astrid always travel in style. These modern Brides love art and culture, contemporary dining, and city escapes. 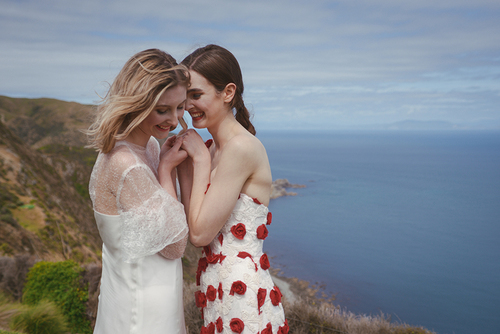 Every detail of their Wellington elopement wedding was carefully planned, with an emphasis on celebrating their love, fashion (Kate’s obsession) and experiencing the high life in New Zealand. To capture the day and make sure they had all the treasured memories to look back on, they had wedding photographer Sarah Burton on hand. Kate loves to pose and saw the wedding as a chance to have her own paparazzi. The girls arrived a few days before with their wedding co-ordinated luggage from Samsonite, after all, it's all in the details. It had been a dream start to their special day with hair and makeup artist Natalee Fisher and a good night's sleep. Their plans then had them whisked away by Wellington Helicopters from the waterfront for a morning ceremony at the stunning Boomrock Lodge. The lift out of the heart of the city and over the rolling hills to Boomrock really got the butterflies going before the big moment of walking the aisle. Kate and Astrid looked dazzling in Kelsey Genna bespoke, and both wore sensational shoes from I Love Paris and carried blousy, seasonal flowers from our own Wellington florist, Yvette Edwards. Making it all official in a very intimate cliff top ceremony, the ladies sealed the deal with an exchange of sparkling jewels from local designer Tory and KO. Planning a Wellington Wedding? Download our full planning guide!